Pros don’t use special gadgets to make sure their cuts aren’t jacked up. 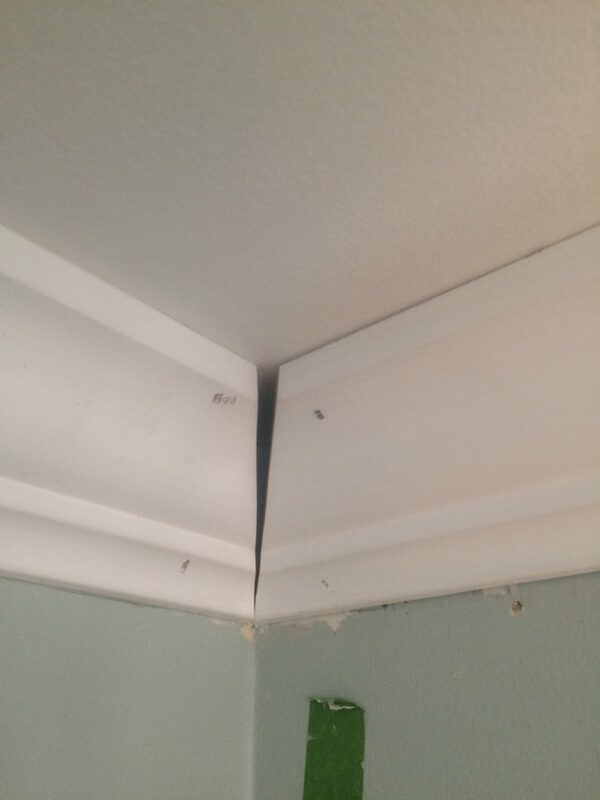 And pros aren’t mislead by big box hardware stores into buying the wrong caulking to fill those gaps (ahem…cough). In fact, if you’ve never done this before, I guarantee you’ll cut some wonky pieces…measure like you forgot your bifocals…and create some gaps wider than the Grand Canyon. 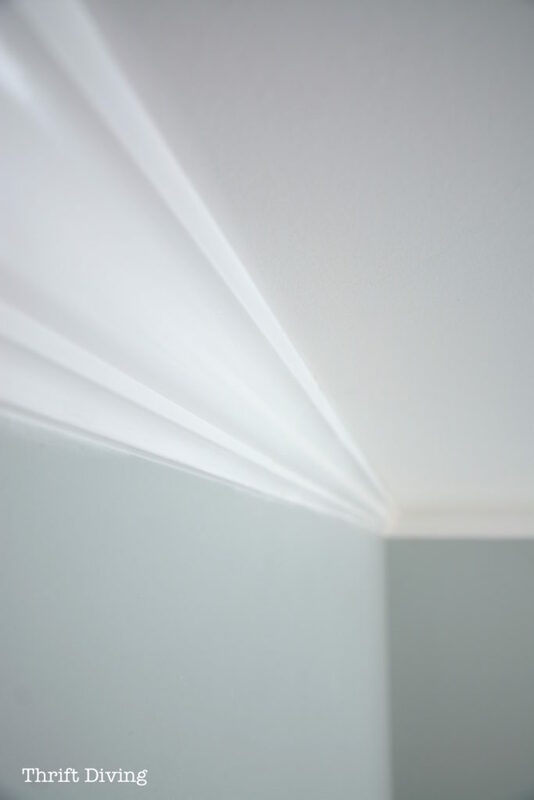 One day I got this brilliant idea to put up crown molding. 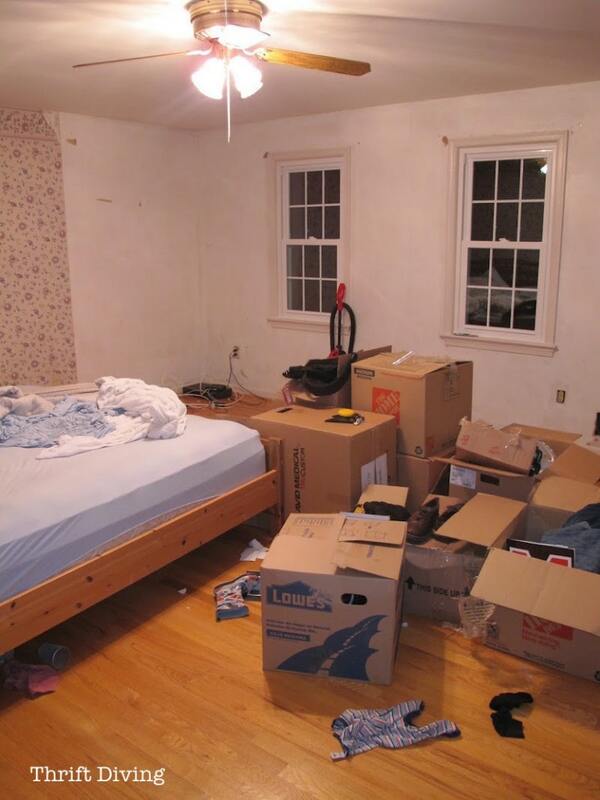 Our master bedroom was barren, as if we’d just moved in, yet we’d been here for 4 years. It needed some “warming up” and some “oomph” to make it feel a little more “homey.” I figured I had the tools (e.g. a miter saw and a nail gun). All I needed were some YouTube videos to teach me how to do it. Easy enough, right? 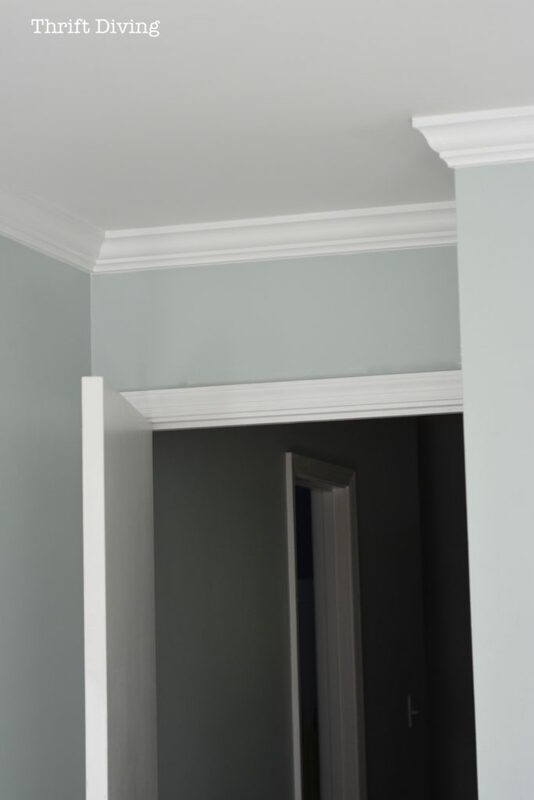 The truth is that crown molding is easy to install, but tough to do it right. Let me repeat: it’s easy to install, but tough to do it right. But if you’re a novice (like me) who’s never done this type of project, but reeeeeaaallly want to try, I’m here to tell you: you can do it! 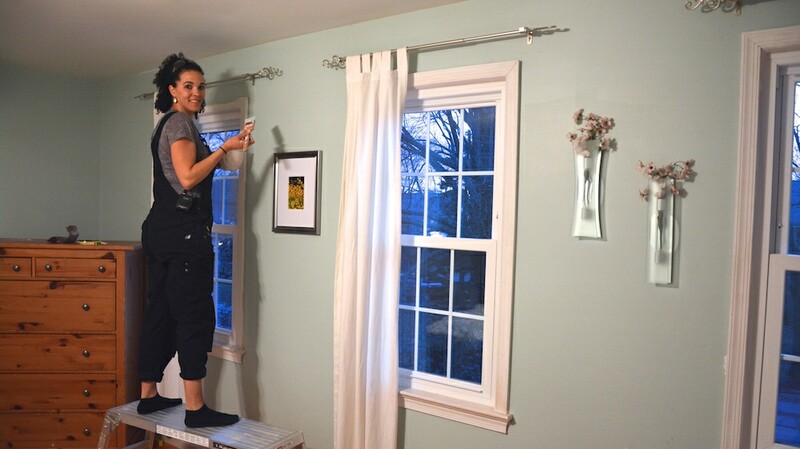 You just need a few power tools, the confidence, and a weekend to get it done (oh, and a helper. You can’t do this alone). 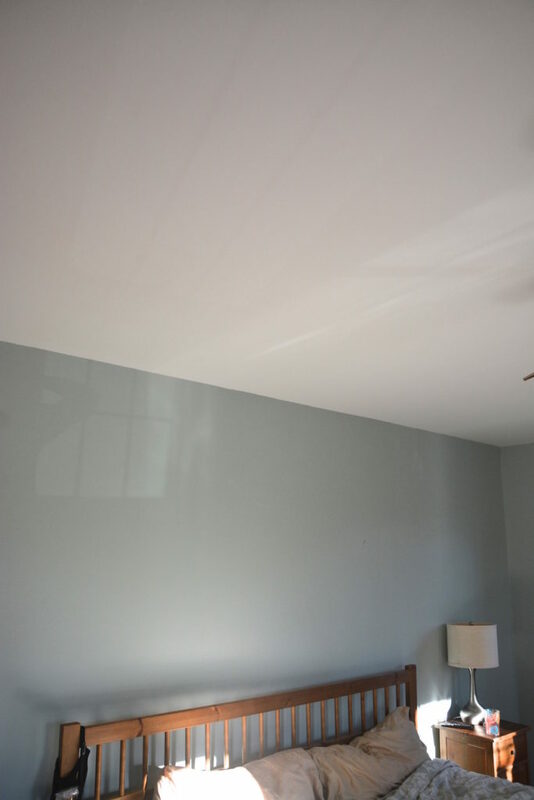 Here’s what my ceiling looked like a couple months prior: dingy ceiling, uneven paint lines…. 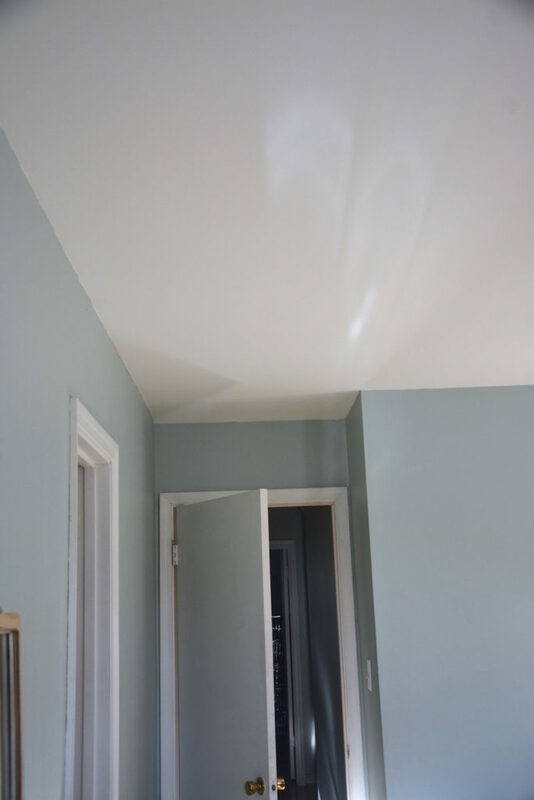 I painted the ceiling a nice bright white, and it looked much better. But it was still missing something. I was hoping the Fairy Crown Molding Mother would bestow upon me the gift of moulding, but–hey–who was I kidding. If I wanted molding, I would going to have to do it myself! 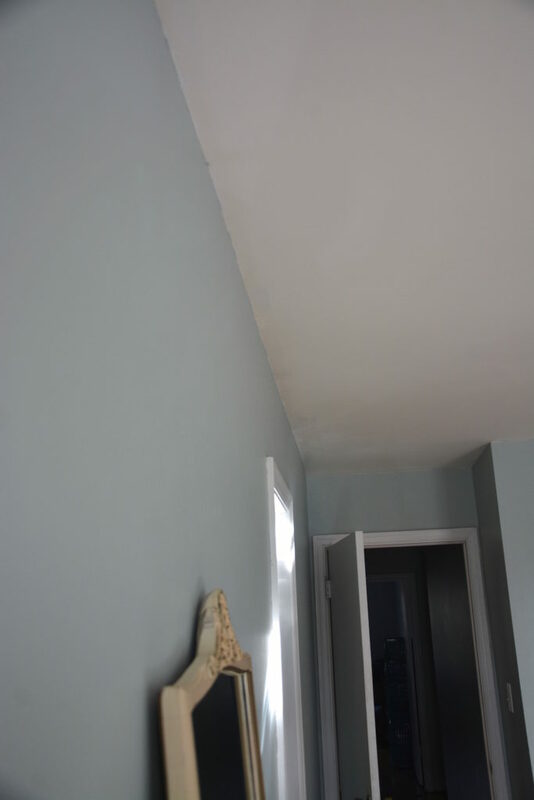 I couldn’t believe it turned out as well as it did, but don’t get it twisted: caulking and paint can hide the ugliest of cracks and gaps. 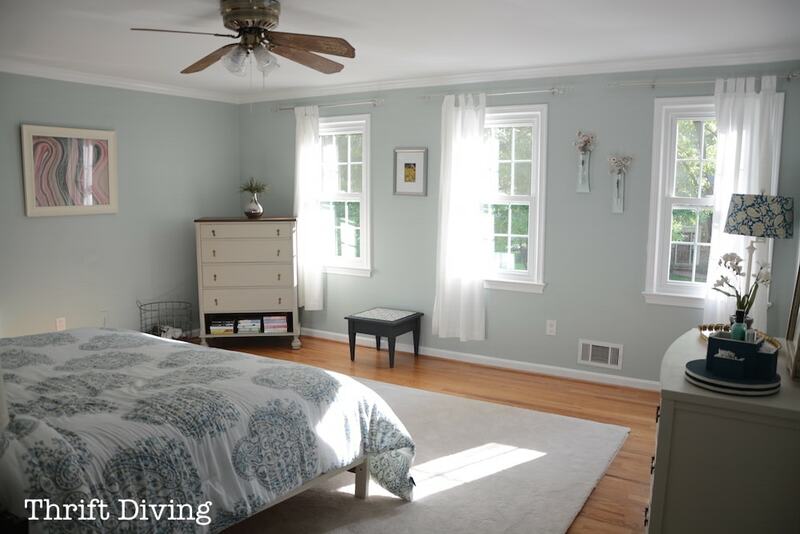 New crown molding, a painted bed, new bedding, and the room looks great! 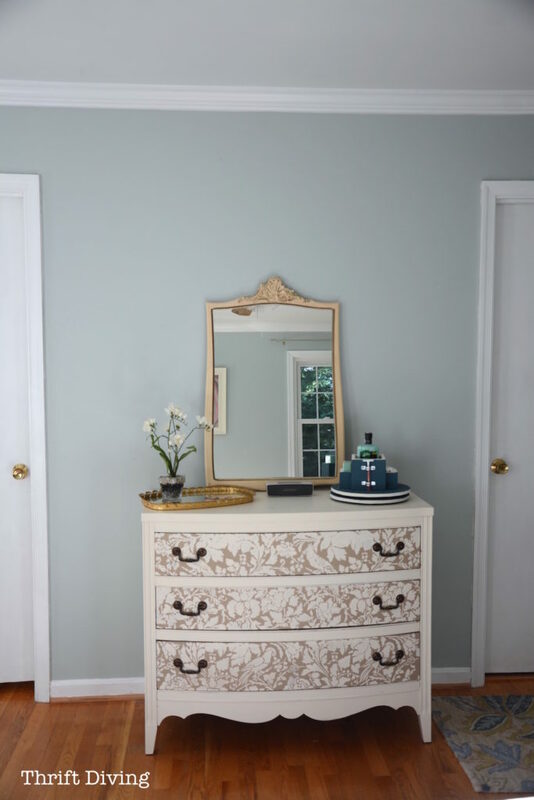 I refinished this vintage dresser my mother-in-law gave me. And I still need to find something cute to put on that black tiled table top I created. But I don’t even notice these unfinished details. 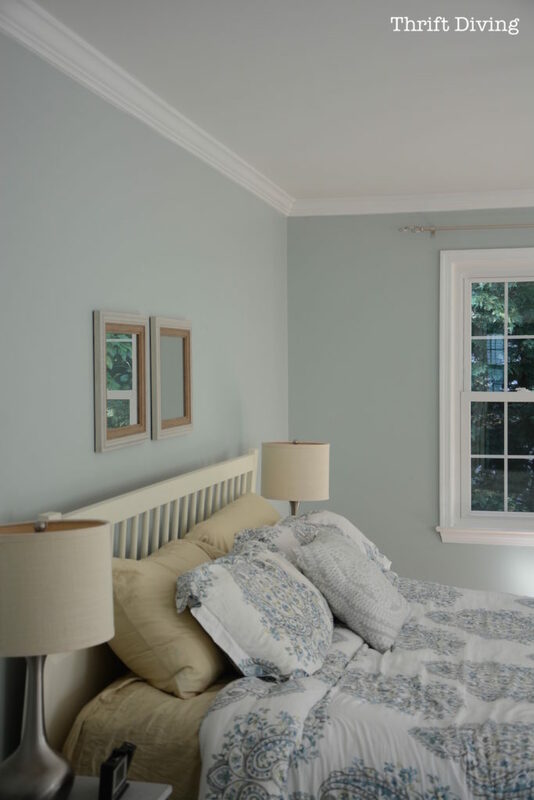 All I can see is how beautiful the Sherwin Williams Rainwashed, which is my absolute most favorite color, looks against the fresh white! …..will hold up through the test of time? 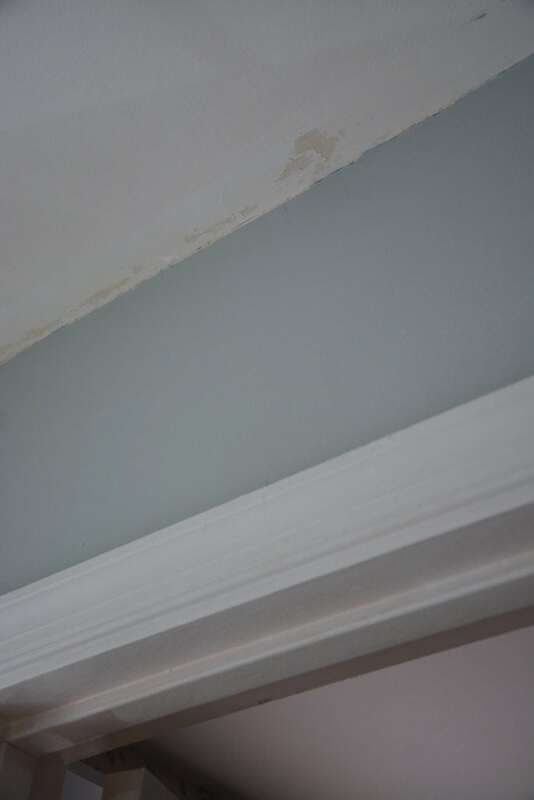 Caulked as much as it could be, it’s barely noticeable. I still need to touch up the Rainwashed paint, but for now, this is good enough for me. Overall, it feels so fresh! 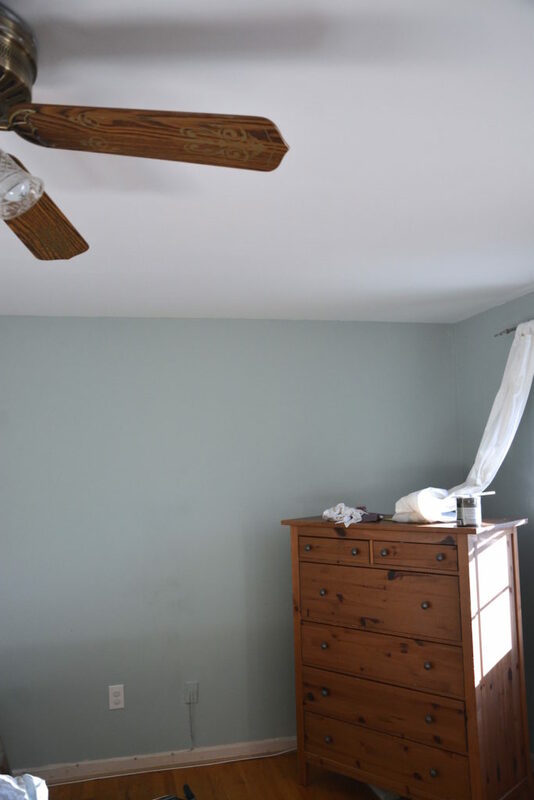 The next step is new curtains and replacing the ceiling fan with one not quite so funky 80’s. I’d rather leave the electrical work for the professionals. 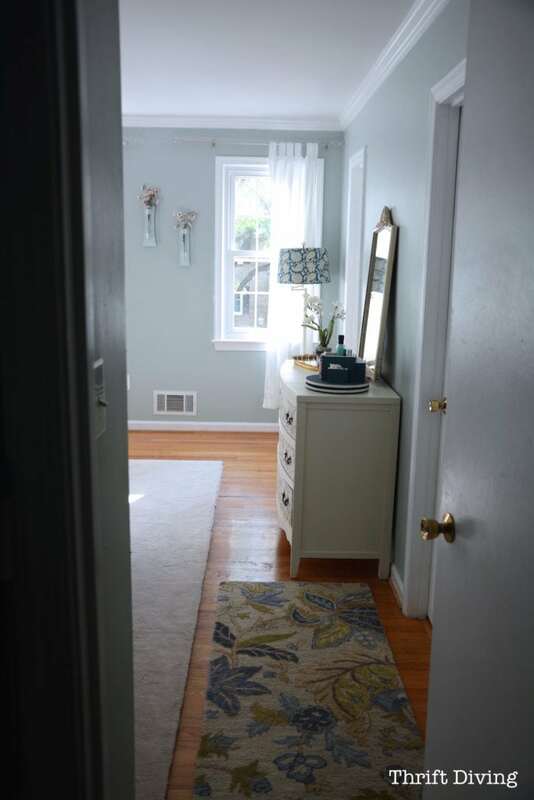 I soooo love my ugly thrifted lamp makeover there in the corner. 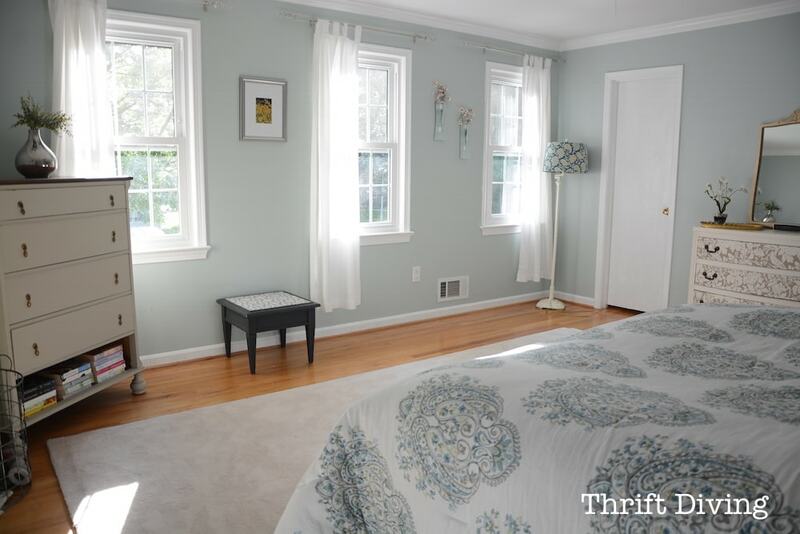 And the vintage dresser to the right houses my clothes. 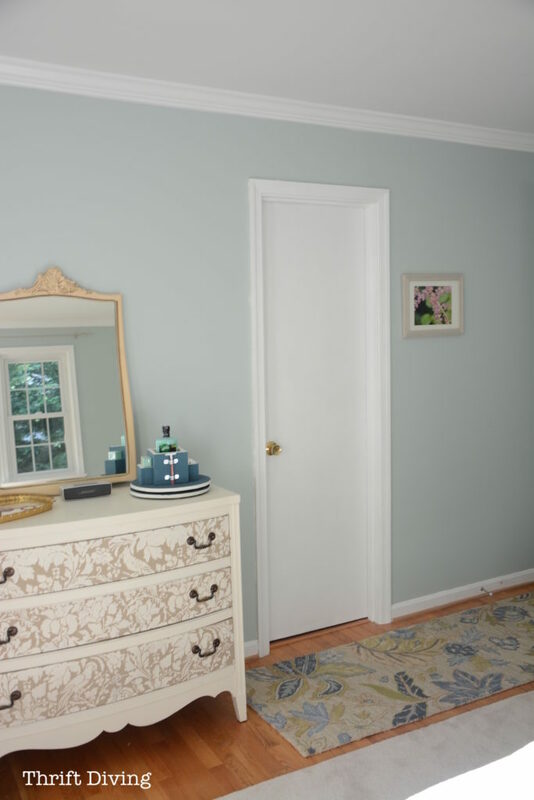 Feels great having a dresser of my own, after hubby and I shared for the longest time! 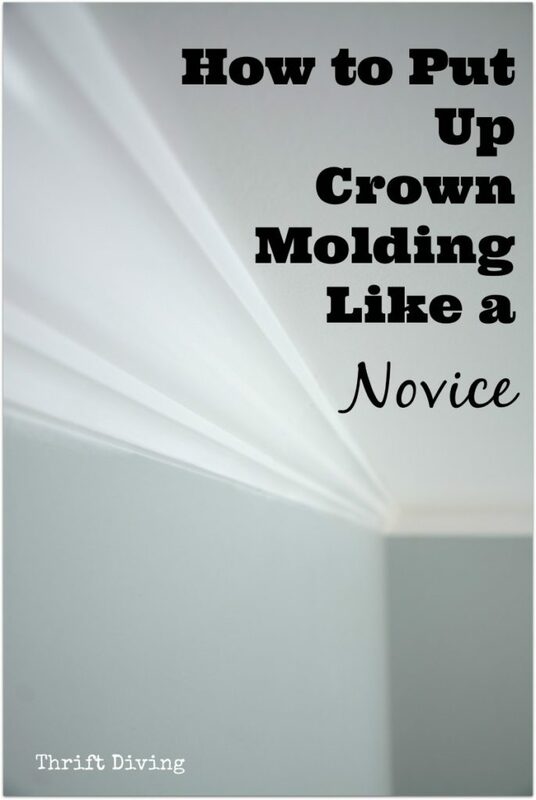 **Don’t forget to download my free 52-page step-by-step tutorial on how to hang your own DIY crown molding! Please let me know if you think it will be helpful! So what do you think, guys??? 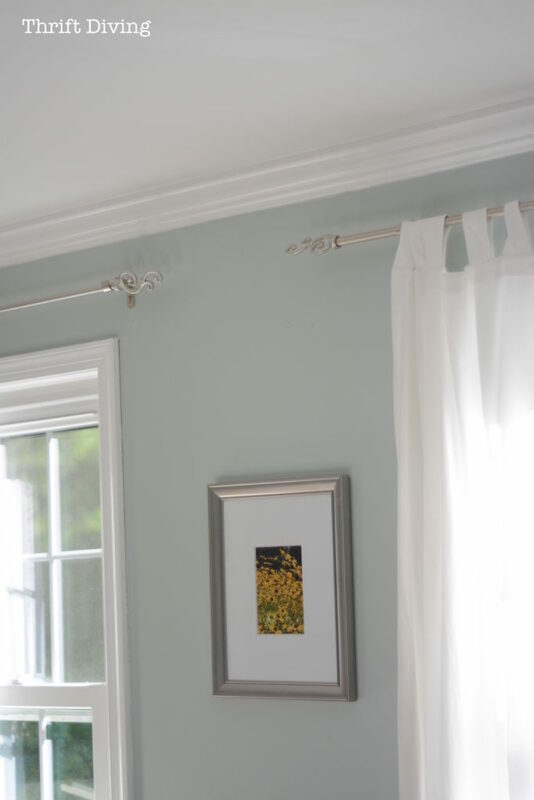 Have you ever thought about putting up your own crown molding? Leave a comment about it and tell me if you have, and if you haven’t, what’s stopping you? Click here to PIN this tutorial and FREE guide! Hi! Would you be able to email me your blog please! 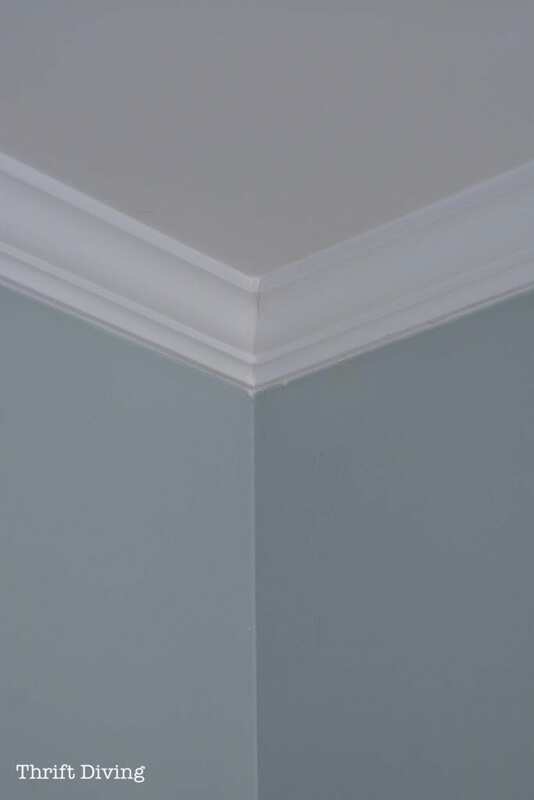 I really want to attempt crown moulding! I’m falling in love with your blog! Is there any way to get an email with your tutorial. The link is giving me an error. Thanks so much! Hey, Aurora! Oh no, sorry about that! Let me check on that and find out what is wrong with the link! 🙂 Thank you for the amazing compliment on my blog! 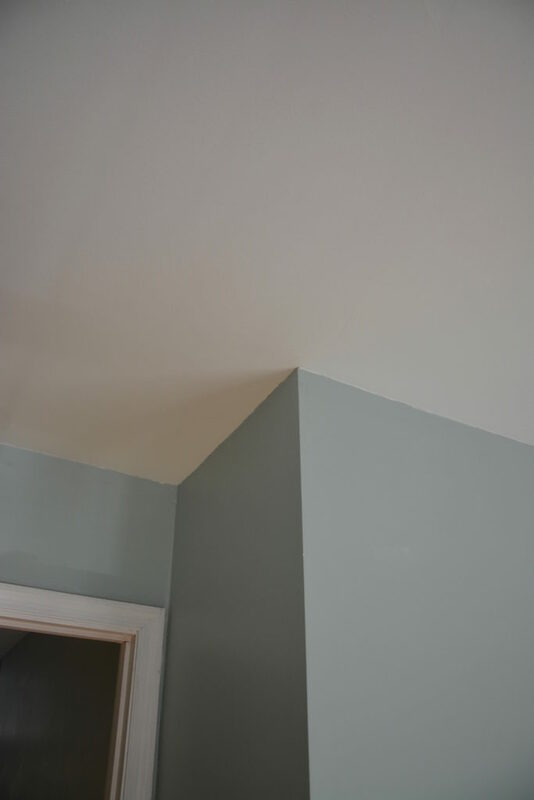 Definitely failed at the crown molding thing so great job! I tried to download but it said it is not available. Any other way I can get your tutorial? Hi! I enjoyed your post. I tried to download your tutorial and have been running into issues. Have you considered zipping the file to help reduce its size? Well, fingers crossed and continuing efforts to dl.